There are a myriad different approaches to both learning and teaching the guitar. And lesson number one is a particularly important one regardless of teaching style and approach. It sets the tone for the relationship between student and teacher going forwards. Regardless of whether the student coming to you is a complete beginner, a seasoned pro, a proficient player of other instruments, or somewhere in between, the first lesson is a fantastic opportunity for putting in place the initial foundation stone for building a resourceful and enlightening (for both parties) developmental partnership. So lesson one. As with the myriad different approaches to teaching and learning, there are also a myriad different approaches to the first lesson. I thought I’d share today with you how I currently take my students through lesson numero uno (and this piece is primarily geared towards an approach with complete beginners, although some elements can always be used at whatever level). I also say “currently” on purpose as I feel one should always be learning, listening, developing and changing elements of one’s strategies as necessary to best serve the student. And with that said I’m more than happy to hear about your points of view and the ways that you, lovely guitar teacher-type readers, take your students through their first lessons! I always like to kick things off with a bit of chat around the reason why the student has either decided to start playing the guitar or pick it up again after a hiatus or, as is sometimes the case, has decided to change teachers. This is important for me to get to know where the student would like to head with their guitar playing, so I can best help them, and also to start building that student-teacher rapport. I also like to ask the student what kind of music they like to listen to, guitar music or otherwise, which guitarists they admire, what classical guitar pieces they really enjoy listening to and would perhaps like to learn in the future, and if they’ve already been learning, what kinds of pieces they most enjoyed playing. This helps me build a picture of where the student is coming from in terms of musical preferences and tendencies, and where we may explore things that would fit in with that and where we may explore things they perhaps are not even aware of of have considered before. So then down to the physical stuff. If the student is a complete beginner we will chat about the guitar and its various constituent parts, what they’re called and their purpose. This is just to start the student in feeling more familiar with the instrument. One of the most important things to get instilled with a new student from the get go is good posture. Instilling a good awareness of posture, body tension and movement from lesson one is a great foundation in which to build a relaxed, efficient and pain-free technique. I get the student seated with their guitar and just ask them to sit and hold the guitar how they think it should be held. 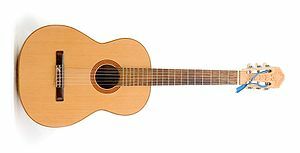 It surprises many new complete beginners that the recognised ergonomic classical guitar playing position is with the guitar between the legs and resting on left leg rather than perched atop the right leg (if right-handed). Next up we take a look at the seated position – where is best to be sitting position on the seat of the chair or stool? On the edge, further back, somewhere in between. I get the student to try various positions until they settle upon one that they think is comfortable (with some careful guidance and questions from myself, of course, to guide them towards a seated position that I believe may be the most functional – everyone is slightly different of course). We then talk about foot stool versus guitar rest and I have samples of both of these that the student can test out to find their preference. My preference is for students to use the guitar rest as that’s something that works for me and I believe is better in the long run for the lower back and hip flexors, but if a foot stool works for a student and that’s what they feel most comfortable with that’s all good. And nothing is set in stone forever anyway. Once that selection is made, at least for now, we talk through position of the feet and legs and how those are used to support the player and the guitar, and where an optimal position or positions may be. We then talk through position of the torso and the most comfortable degrees of straightness or relaxation when playing. I generally advise the student to be in a position where they’re “holding form” with the their torso and not sitting bolt, rigid upright, as this brings considerable tension and then difficulties into the playing. This then leads on to a discussion of left arm and hand and right arm and hand positioning relative to the instrument. The next step is in getting the student listening in to the sounds they make when plucking an open string. Firstly I demonstrate the action of say the right hand i finger, and ask them to listen to the differences in tone between different angles of attack of the right hand fingers. I then get them playing the open string, experiencing the feeling of playing and how that sounds. My approach with this depends slightly on whether the student has read music before. Let’s assume here that it’s someone that hasn’t, so we’ll then talk about the stave, the treble clef and what the open treble strings look like written on the stave – E, B, G – using this as another good opportunity to play them, make a nice sound and then begin to establish ink on a page to strings on the guitar. I also like to then have a high-level discussion on rhythm and pulse. I introduce the concept that without a steady pulse, whether slow or fast, just like us human beings, the music cannot live; it keeps the music going. We then might look at some simple rhythmic elements such as the crotchet, minim and semibreve. Of course, this process isn’t written in stone and I’m guided as to how the student is coping, taking it all in and responding to what we’re doing. I’m calibrating my approach throughout to best serve the student at the time, but hopefully this has now given you a bit of a taste of my approach to lesson number one. I’d love to hear you own approaches and thoughts too! Previous postA change to today’s post….